It's been one year since a virus triggered junk DNA and people all over the world started changing. Becoming something else. Craving blood. It's been ten months since the word 'vampire' stopped being something from old monster stories and Hollywood movies. It's been six months since our world and theirs erupted into war. It's been two months since an uneasy peace was signed. It's been one hour since that peace was shattered. The war is here again. The vampire war. Our world will burn. Our world will bleed! When anyone can turn, when every street is a battlefield, there is nowhere to run! 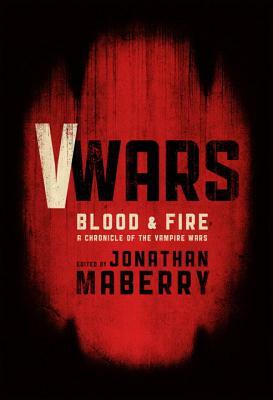 V-Wars: Blood and Fire is edited and co-written by New York Times bestselling author Jonathan Maberry and features all new stories of the Vampire Wars by Kevin J. Anderson, Scott Sigler, Larry Corriea, Joe McKinney, Nancy Holder, Yvonne Navarro, Weston Ochse and James A. Moore. Soon to be a 10-episode series from Netflix starring Ian Somerhalder. Jonathan Maberry is a New York Times best-selling and multiple Bram Stoker Award-winning suspense author, editor, comic book writer, magazine feature writer, playwright, content creator, and writing teacher/lecturer. He was named one of Today’s Top Ten Horror Writers. His books have been sold in more than two-dozen countries. Among his numerous book and comic credits are the shared-world anthologies V-Wars and its sequels, V-Wars: Blood & Fire, V-Wars: Night Terrors, and V-Wars: Shockwaves; the X-Files short story anthologies The Truth Is Out There, Trust No One, and Secret Agendas; the V-Wars comic series; and the comic series adaptation of his zombie novel Rot & Ruin; all from IDW Publishing. Kevin J. Anderson has published more than 140 books, including numerous novels in the Star Wars, X-Files, and Dune universes, as well as the steampunk fantasy novels Clockwork Angels and Clockwork Lives, written with legendary rock drummer Neil Peart. His original works include the Saga of Seven Suns series, the Terra Incognita fantasy trilogy, and his humorous horror series featuring Dan Shamble, Zombie PI. He has edited anthologies and written comics, games, and the lyrics to two rock CDs. He and his wife Rebecca Moesta are the publishers of WordFire Press. Larry Correia is a fantasy and thriller writer, firearms instructor, accountant, and retired Merchant of Death. He describes himself as “Male. Very large. Very bald.” He lives in Yard Moose Mountain, Utah (his name for it). He's best known as the writer of the Monster Hunter series of horror fantasy novels. Scott Sigler is a #1 New York Times best-selling author who's written fifteen novels, six novellas and dozens of short stories. He lives in San Diego, with his wee little dog Reesie. Both Scott and Reesie are diehard Detroit Lions fans. Yvonne Navarro is the published author of twenty-two books and a bunch of short stories, including solo novels and media tie-ins to franchises like Buffy the Vampire Slayer, Elektra, Hellboy, an Aliens book, and others. She's married to writer Weston Ochse. They live in Arizona.